Brian Harrell, CPP, is a Senior Fellow at The George Washington University Center for Cyber & Homeland Security (CCHS) where he provides insight and analysis on homeland security, counterterrorism, and cybersecurity issues. He is the former Operations Director of the Electricity ISAC and Director of Critical Infrastructure Protection Programs at the North American Electric Reliability Corporation (NERC) where he was charged with helping protect North America's electric grid from physical and cyber-attack. Brian is the creator of the NERC Grid Security Exercise (GridEx) and the thought leader behind many of the physical and cybersecurity CIP standards used today by utilities. He has helped critical infrastructure companies protect their IT systems, industrial control systems (ICS), and facilities from attack. 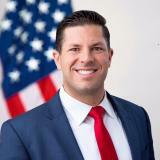 Brian has spent time during his career in the US Marine Corps, at the US Department of Homeland Security, and various other private sector agencies with the goal of protecting the United States from security threats. Brian was recently recognized by Security Magazine as one of the most influential people in security. Check out the incredible speaker line-up to see who will be joining Brian .